Are you concerned about viruses, bacteria, germs, yeast and other microbes that grow on, feed on, create a foul odor and deteriorate your floor surfaces? Did you know that your floors have crevices, pockets, pores, seams and cracks that trap dirt & grime and potentially cause harmful sicknesses for pets, adults and especially small children? Are you aware that mold, insects and harmful bacteria can grow within the smallest crevice of a standard floor? Well, with "Original Floors" By: Atkins General Construction, your worries are over! Our flooring systems are formulated an epa-registered anti-microbial component which prevents the growth of potentially harmful microbes. This is incorporated into our entire flooring system and not just the "top-coat"...therefore you don't have to be concerned about it "wearing off" with the sealer. Example: If your floor were to be scraped or gouged, it will still have it's own "protection" built right in. Your floors will be resistant against staining, mold, fungus, and bad odors. "Original Floors" By Atkins General Construction, will not deteriorate, because they are protected against bacteria, viruses, yeast, and other microbes. This is very important to consider when planning for a veterinary floor, restaurant kitchen floor, aquatic center, and public restroom flooring. 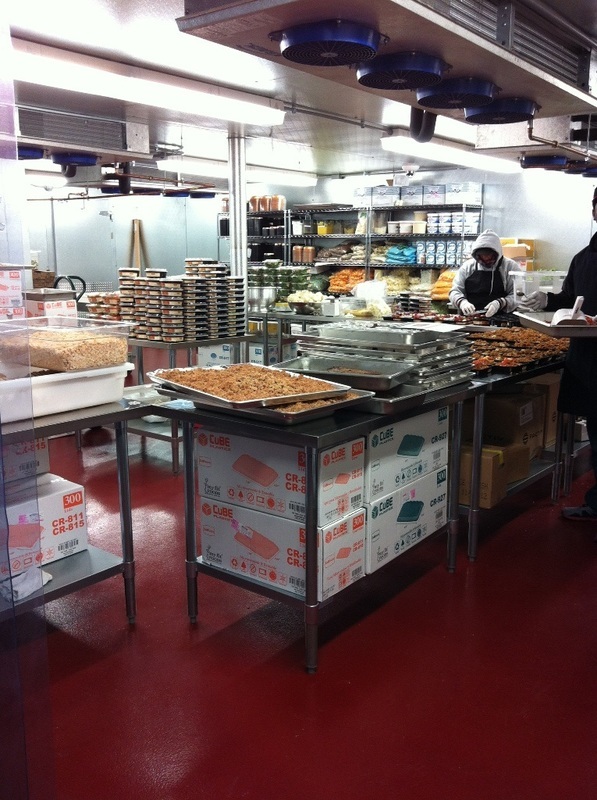 Our flooring systems are seamless, and are applied in multiple layers. They are resistant to water, and yet, are easy to clean. The maintenance of the floors is relatively simple and easy...no hard scrubbing or "elbow grease" is needed and no harsh chemicals are required. With the proper (eco-friendly) cleaning agents, the dirt and grime will just "bead up" and gently rinse off. "Original Floors" By Atkins General Construction will end up saving you time and money, in the long-run. May Everyone Have A Wonderful, Happy & Safe Thanksgiving! Anyone who has ever renovated a room, knows that one of the most important (and probably toughest) decisions to make is what type of flooring to put down. Particularly in high traffic areas, the flooring material you choose has to be durable, attractive, easy to care for, and affordable. With so many options available, selecting flooring that will serve you well for years to come, can be a daunting task. One really cool, smart, energy-efficient, eco-friendly and easy to care for product is Epoxy-Resin Flooring Systems by Atkins General Construction. Folks continue to be very intrigued by this innovation and some of the age-old problems of traditional flooring materials that Epoxy Flooring Systems solve. These floors are scuff and slip-resistant. They have anti-microbial properties. You can even use this material for countertops for a special surface that allows for the ease of killing bacteria and the washing away of dirt, soil, and infectious germs. Luxury flooring that offers comfort, while it's appearance is sharp and clear, with HD-quality patterns that look much like marble, stone, granite or wood. If new flooring is on your shopping list this year, check out Atkins General Construction's Specialty Flooring Division, before you step foot into any store. With us, you will find more information about all the newest trends, but ones that are set to last a lifetime. We also offer a technical room designer, purchasing and installation advice and decorating ideas, as well as access to Flooring Engineers that are happy to answer some of your most problematic flooring questions. Lighting: Offering several different lighting options for employees in an office setting has been psychologically proven to enhance creativity. According to experts, bright lighting enhances teamwork and more methodical thinking experience. On the other hand, dimmer lighting fosters creativity and out of the box thinking. Lighting is incredibly important in office productivity for bad lighting can cause fatigue, irritability, headaches or even depression. Plants: It has also been proven true that plants, real or fake, have different effects on people when in an office setting. Studies have indicated that plants, flowers and other forms of decorative vegetation improve the overall happiness of clients and employees, while increasing productivity as well. Plant life has also been associated with better breathing, longer attention spans, and stress relief. Control the noise: Although it may seem impossible to completely manage the noise levels of an office space, there are tips available for work environments to permit noise when necessary, quiet when needed, to improve overall productivity levels. In any office environment, one can properly utilize commercial flooring solutions in order to enhance creativity, efficiency and a more pleasant workplace, such as carpeting, epoxy flooring, and paneling. These devices, as well as tile ceilings, are available to help absorb sound waves and reduce echoing or carried voices. It is also recommended to keep fax machines and other noisy appliances in one central location, as well as keeping noisier employees separate from the quieter ones (i.e. sales people, customer service, those on the phone often). Color: The color of any room has a direct effect on the people in it. 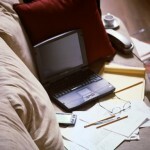 Depending on the color scheme of a particular room, moods and emotions can be affected. For instance, blue has been scientifically proven to encourage feelings of happiness and increase levels of productivity in an office space. Since our brain functions are drastically triggered by the color patterns of our surroundings, it is important to surround yourself with productive, positive colors while at work. Most people do not have any control of the wall colors of their office space, but adding creatively-encouraging colors to your cubicle or desk can make all the difference. 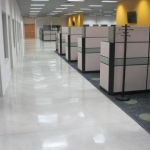 Atkins General Construction Specialty Flooring Division is here to assist you in the design of your office space so that it offers the proper appeal and aesthetics needed to "get the job done"! 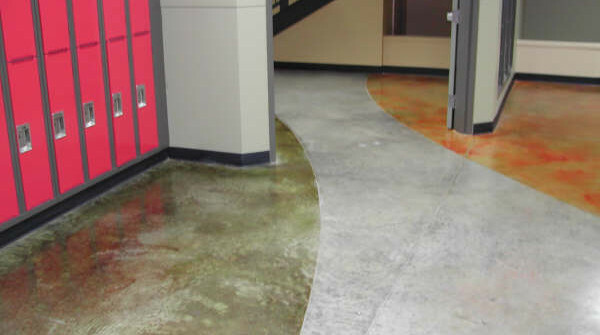 Resinous concrete floors are an ideal flooring for most school areas, with few considerations. 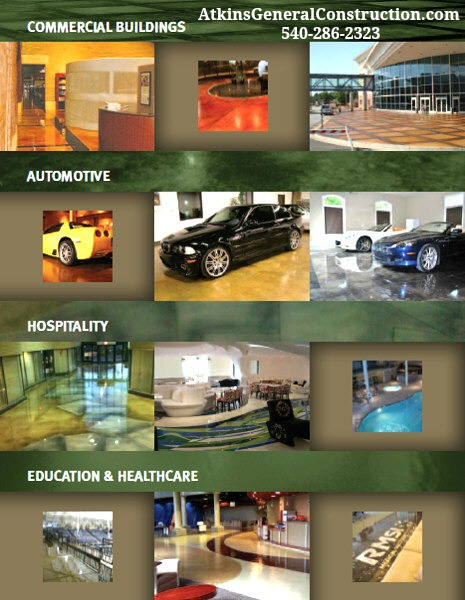 Concrete floors are durable, have aesthetic potential, and are low maintenance. This makes them ideal for hallways, auditoriums, offices, restrooms and classrooms. Concrete floors also get high marks for requiring less maintenance. They are higher in durability and they have less of an environmental impact that vinyl or carpet. High performance coatings make concrete even more durable. When the bricks on Susan Lewis` front porch began to break and chip, she reached out to the crew at Atkins General Construction and they immediately took action. Lewis says of the Stafford County based Contractors, “they were knowledgeable about the work that needed to be done, and I am happy with the professional end product”. Cracked or damaged masonry is not only an eyesore. These defects may worsen if left untreated. Cracks and holes in your masonry may also allow pests, water and drafts into your home, causing further damage. If you notice cracks or holes in your bricks or concrete blocks, Atkins General Construction, a professional masonry construction company, can help determine whether the damage is repairable or if the bricks or concrete blocks require replacement, like the ones on Lewis` porch. Exposure to the elements, shoddy workmanship, uneven settling of the soil beneath your home and damage from vermin can all lead to cracks and holes in your masonry. Water is the most destructive force that interacts with your bricks and concrete blocks. Persistent exposure to water weakens concrete and may eat away at the mortar between the bricks or concrete blocks. Shoddy workmanship or the use of inferior materials during the construction of your home may cause damage to your bricks and concrete blocks. Over the years, the ground beneath your home settles and uneven settling leads to damage in your masonry. Pests and vermin including rodents and insects may eat their way through the mortar, brick and concrete and cause damage. You may notice signs inside and outside of your home that indicate the need for masonry repair. These signs include uneven floors; cracks in the concrete slab of your basement or driveway; cabinets, windows and doors that no longer properly close; and cracks in the plaster or drywall of your interior walls. Once your masonry has a small crack or hole, there is an opportunity for water to penetrate further into the structure. Once water has access to your masonry, freeze and thaw cycles and movement of the water cause holes and cracks to grow. These holes and cracks weaken the structure of your home. Atkins General Construction is able to inspect your bricks and concrete blocks. The inspection will include measurements of the width and length of the cracks, diameter of holes, and analysis of whether your masonry walls are shifting or bowing. Repairs may include filling and sealing cracks for minor issues all the way up to the installation of support beams and external piers for serious damage. When the cracks or holes in your bricks or concrete blocks are so severe that the wall can no longer bear its load, the masonry will need replacement. During masonry replacement work, Atkins General Construction will do their best to find matching bricks or concrete blocks for you home. Masonry repair and replacement requires specialized skills and tools and the expertise to deal with complex situations. All masonry repair and replacement done by Atkins General Construction is performed for the best and longest lasting results. Atkins General Construction can determine whether your home is in need of repairs or replacements. “Atkins General Construction provides quick, professional service at a fair price," says Susan Lewis…”I recommend them highly”. Be Energy Efficient Since your heating system will be running constantly throughout the winter, remember to change out your HVAC filters every month. Inspect the insulation in your attic and crawlspace. Warm air rises and leaves the house through the roof, so you should focus on insulation in your ceilings. Seal areas around recessed lights, the attic hatch, and plumbing vents that may be allowing warm air from the living space below to enter the attic. Proper attic ventilation, adequate attic insulation, and a tight air barrier between the attic and the interior of the house will work together to prevent ice dams. Protect Your Pipes Pipes located in attics, crawl spaces, basements, and near outer walls can be susceptible to freezing in extreme temperatures. When the forecast calls for unusually cold temperatures, let water drip from hot and cold faucets overnight. Also try keeping cabinet doors open to allow warm air to circulate in places like below sinks. If you open the cabinet doors, be sure to remove anything inside the cabinets that may pose a safety to hazard to children, such as household cleaners. For exposed pipes in your attic, basement, or crawlspaces, add extra insulation around them. Be Ready For An Emergency Blackouts and snow-ins can occur during winter months, so take a moment to prepare yourself and your family for such emergencies. Having the following items ready will help you make it through safely. Holiday Decorations ’Tis the season to be festive, but remember to stay safe with your holiday decorations. Inspect the wires of your light display before switching them on: They may be frayed and present an electrical fire hazard. Same goes for the Christmas tree inside; always check the light strands for any sign of wear-and-tear from being in storage. If you have a real Christmas tree, keep it watered, since dry trees catch fire easier. Check with your local municipality for instructions on how to dispose of the tree once the new year arrives. Winter Yard Care Even with the cold weather conditions, your yard still needs to be maintained. Make sure tree and shrub branches are well away from the house and windows. Icy conditions can cause branches to break and damage your home. Walk around your home and survey the roof to see if any ice dams have formed; call a contractor if you suspect this is the case. As you walk around your house, check the foundation for small cracks or openings where mice or other pests can tunnel in. Winter is when they seek the warmth of your house, so seal up any possible entrances. While you’re outside, clear snow off gas meters and away from basement windows and your dryer exhaust vent. There is perhaps nothing more lovely in a kitchen setting than granite countertops. A granite countertop is usually a main focal point of the room and makes people stop and stare every time they enter the kitchen. Granite countertops are available in a wide array of colors and have various patterns within them. No matter what style of kitchen you have in your home, chances are that a granite countertop will go perfectly within it. Read on to discover some of the fantastic reasons to install a granite countertop in your home. A Granite Countertop Is Stylish One excellent reason to install a granite countertop in the home is that it makes for a stylish addition to the room. Granite just has that look of elegance and richness which is not often found with other countertop materials. If you are looking for that wow factor, then installing a granite countertop is an easy way to achieve this goal. Also, when you install granite countertops in your home, you are adding instant value to the home. Granite is often seen as a luxury material and if you are selling your home or even if you plan on living in the house for many years to come, you can rest assured that the value of the granite countertop will persist as well. Granite Is an Extremely Durable Material You will also find that by adding granite countertops you are choosing an extremely durable material for your counters. Granite can take a good amount of use without showing wear and tear. This is another wonderful reason to install granite countertops in your home. If you are looking for the ideal countertop material, then look no further than granite. Your granite countertops will be completely stylish, add value to your home and are quite durable in nature. 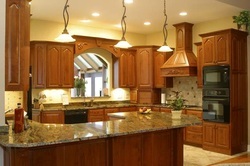 Kitchen granite countertops can create a brilliance and elegance that is only found in nature. 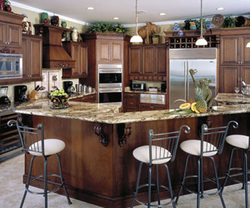 Granite adds a personality and character to kitchen countertops that is unsurpassed. Kitchen granite countertops have a natural beauty that is capable of complementing any tone of wood or style of cabinets. Atkins General Construction is available to assist with your Granite Countertop installation & Kitchen remodeling projects. Air Conditioner Troubleshooting, Before You Call The Repairman ...Then if these tips don’t get you up & running again~feel free to give Atkins General Construction a call. Before you make that call, try this basic air conditioner troubleshooting guide. This guide will help you to diagnose problems with your typical ducted split type air conditioner. If you have a ductless air conditioner, a window air conditioner or a portable air conditioner we have air conditioner troubleshooting guides that are tailored for those types of units. You should ensure that the routine maintenance has been performed on the unit. If the air filter has not been changed in the past month, check to see if it is dirty. Begin your air conditioner troubleshooting at the thermostat by ensuring that the thermostat is on cool and that it is set lower than actual room temperature. This is to ensure that there really is a problem. It may seem silly but that is the first thing a repairman will check and you will normally still be charged a service call even if that is the only problem. Is the furnace/air handler fan running? If it is not, then, check to see if the fan on the outside unit is running. If the fan on the outside unit is not running either, check to make sure that the breakers for the furnace/air handler and the air conditioner are on. If the breaker is not tripped, then the problem may be your thermostat, the furnace/air handler control board, or the wires between the furnace/air handler and the thermostat. If your unit has a condensate pump, check to make sure the reservoir is not full. If the reservoir is full, a limit switch will normally stop the air conditioner from running. You will need to repair or replace the pump. If the breaker is tripped, you can reset it by shutting it off and then turning it back on. If it trips again, then check the wiring in the furnace/air handler for signs of damage and repair as necessary. If the blower is running but the fan on the outside unit is not, then continue your air conditioner troubleshooting at the outside unit. If the blower isn't running but the fan outside is, the problem could be the blower motor, it's run capacitor or the furnace/air handler control board. If the blower on the furnace is running, check to see if you see any frost or ice around the units. You might also notice water around the furnace. Is there ice on the copper lines going outside? If yes, then shut the outside unit off for a couple of hours but let the blower on the furnace run. This will allow the ice to melt. After two hours, you can continue your air conditioner troubleshooting. Turn the ac back on and let it run for about five minutes. Now feel the larger copper line at the outdoor unit. This should be cold and have condensation on it. If it is not cold or if frost is forming on the line, it is probably a freon problem. You will need to call a repairman, such as Atkins General Construction, because of federal refrigerant usage regulations. If there is no ice or frost, then continue troubleshooting at the outside unit. If the fan motor is not running, then shut the power off to the unit. Then check all wire connections for signs of damage such as burning and repair as necessary. You should also check the wire connections in the compressor terminal box and repair if necessary. You can use our capacitor testing guide to check the unit's capacitors and replace as necessary. Continue your air conditioner troubleshooting by turning the power back on to the unit and observe whether the contactor closes or not. If the unit does not start, look for a reset button. Some units have a high pressure cutout switch that can be reset. Then, use a voltmeter to check to see if you have power to the unit and 24 vac to the contactor's coil. If you do not have power to the unit, you should check the wiring between the electric panel and the unit. If you do not have 24 volts to the contactor's coil, check the thermostat and the low voltage wires from the furnace/air handler to the condensing unit. If you have power to the unit and the coil on the contactor but the unit does not start, the unit’s contactor may be bad. If the compressor starts but the fan does not, the condenser fan motor could be the problem. If the condenser fan starts but the compressor does not, the unit may be low on refrigerant, the compressor might be too hot, or the compressor might be bad. If the condenser fan and the compressor both run but the cooling effect is not adequate, you should check the temperature drop of the system. **NOTE** The unit should be operating for 10-15 minutes prior to taking temperature measurements. To measure the temperature drop, measure the air temperature leaving the air handler and subtract it from the temperature of the air entering the air handler. The result should be about 15 degrees for a high efficiency unit and about 18 to 20 degrees for an older unit (SEER less than 10). If the temperature drop is significantly lower than that, the problem may be the refrigerant charge. If the temperature drop is significantly higher than that, then your air conditioner troubleshooting should focus on the system's air flow. The evaporator coil, filter, or blower wheel could be dirty. This is usually the result of not performing routine maintenance on the system. It could also be caused by a duct system that is too small. This is usually the result of improper design or installation. You may be able to increase the blower's cooling speed or replace your existing blower motor with a variable speed motor to overcome that problem. 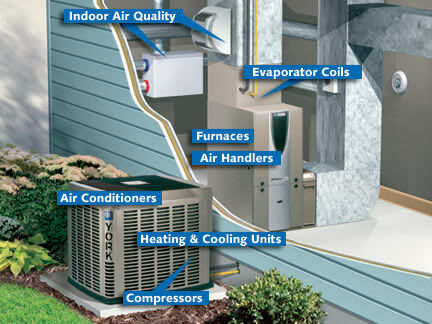 If you require further assistance in your air conditioner troubleshooting, you can use our consulting services. For a small fee, our staff can assist to help you to solve the more complicated issues with your air conditioning system. We believe kitchens are America’s most central home space. So, we at Atkins General Construction encourage customers to take time in deciding on kitchen cabinets. stores throughout the Fredericksburg & Northern VA area. Kitchen cabinets need to be selected by the amount of money, time, and functionality you’re willing to invest. And, rest assured, each option provides quality and appealing styles. Available: Any home improvement store in the Fredericksburg & Northern VA area. Features: Strictly standard options for drawers and shelving. kitchen’s shape and your taste. Available: Some home improvement stores and cabinet suppliers. Installation: Orders must be placed, requiring some wait time. Selection: A wider array of sizes, materials, and finishes. Available: Only at cabinet suppliers. Installation: Requires more wait time and perhaps special installation. to look at higher priced cabinets. Remember, kitchen cabinets are the most integral feature of your kitchen. Custom design can be affordable! Our team at Atkins General Construction can provide more details.